Over the past year, many more people have asked to receive Euclidean’s letters. This is flattering to us. We aim to share insights and perform at a level that validates your attention. In recent letters, we examined value investing’s future prospects and outlined how new developments in deep learning have the potential to augment our investment process. As investor attention has recently been devoted to making sense of Britain’s vote to exit the EU, we thought it worthwhile to explain—as an introduction to some and as a refresher for others—why we ignore these types of developments and instead focus our investment process on company fundamentals. A Question: How to Invest Our Hard-Earned Assets? Prior to Euclidean, we founded and built a company over 10 years. Across that time, our energy was exclusively focused on company building and our attention was devoted to thinking hard about what gave our company its value. When we sold our business, this focus took on a new context. We had liquid assets to invest for the first time. Given our prior experiences and John’s background in machine learning, we began to wonder what history could teach us regarding how to evaluate individual companies as potential equity investments. Are there useful, enduring lessons for evaluating companies to be found in the past? And, if so, to what extent can those lessons be understood by looking at the historical data characterizing companies’ operations and market prices? These questions—and the way we went about searching for answers—emerged out of formative experiences from early in our careers. We began working as partners right after college in the mid-1990s and grew up as entrepreneurs and businessmen at a time when a lot about the capital markets eluded easy understanding. The world went from somewhat normal to extremely optimistic with enthusiasm about the Internet and then to deeply pessimistic as the dot-com bubble popped and as terrorists struck American soil for the first time on September 11th, 2001. Our direct experience fully reflected the extremes of this cycle. We built a company across 36 consecutive sequential quarters and yet saw the private market value of our company fluctuate by a factor of 3 or more. This occurred as investors focused on external developments that ultimately had very little long-term impact on the fundamentals of our business. The result was that we found ourselves on a valuation roller coaster. Imagine this: a business that is growing in a reasonably steady way finds investors willing to pay approximately 300% of what previous investors paid just 2 years before, then 70% less 3 years hence, and finally prices 500% higher 4 years later. If you think that sounds crazy, you are right. And yet, it was our reality. It felt at the time, and certainly seems clear in retrospect, that those prices swung far above and far below what would have been a reasonable assessment of the intrinsic value of our business. We think that many current founders of high-growth technology companies have a similar feeling. Perhaps the owners of most public companies also feel this way to some degree after reflecting on the stunning, up-and-down, Brexit-related moves at the end of June. But these kinds of swings—albeit less severe—can be observed in all environments even for well established, public companies. For example, Disney, General Electric, and Amazon show 52-week highs 40%–75% higher than their 52-week lows. This type of volatility in market prices is the norm. Yet, much like with our own company, the earnings power and potential of these businesses has not fluctuated to anywhere near the same degree as their stock prices. So, what gives? This question was explored by Robert Shiller in the 1980s and formed the basis for his Nobel Prize. Shiller’s research was noteworthy because it challenged the then-dominant economic theory, which was that the stock market is efficient and thus, a company’s price and value are the same. Shiller’s insight was to look at companies from the past and measure how their cash distributions evolved over time. Doing so gave him a measure of “clairvoyant value,” which is what an investor with perfect foresight should have been willing to pay for a company based on the actual cash he or she would have received from the investment. As Shiller looked at this measure for 1871 through 1980 (and his work has been updated through the current day), he saw that stock volatility has been much too extreme to be explained by any rational estimate of companies’ future distributable cash. Shiller’s conclusion is important and aligns with our experience. Price and value are distinct measures, and they can diverge wildly for individual companies — often particularly so when investors focus on predicting how some macro event will impact the world economy. This is a promising idea. After all, a market that creates these disconnects presumably also creates opportunities to buy shares when prices understate a company’s value and then to sell shares when prices equal or exceed it. How Can We Capitalize on These Divergences? The challenge with Shiller’s observation is, of course, that we are not clairvoyant. We cannot accurately predict what his investor with perfect hindsight will conclude 10 years hence. Fortunately, Shiller’s work provides a clue regarding how to capitalize on his findings, and it does not require us to be clairvoyant. 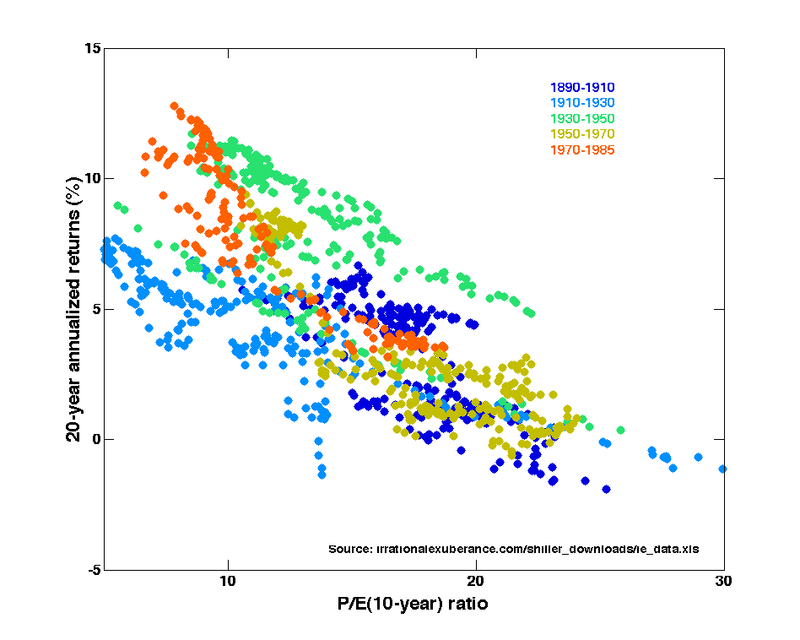 His research showed that companies’ earnings serve as a long-term attractor to market price. That is, when stock prices get very high in relation to earnings, they subsequently tend to perform poorly. And conversely, when stock prices get very low in relation to earnings, they tend to deliver better-than-average returns. This observation has held across decades characterized by world wars, varying inflation and interest rate regimes, the dissolution of the Soviet Union, technology cycles, oil shocks, and other developments that have taken investor attention away from company fundamentals. While Shiller’s research focused on the market as a whole, the chart below gives a glimpse of how this dynamic plays out with individual companies. This example shows what has occurred in the past when individual companies are priced very low and very high in relation to their fundamentals. This chart shows the market divided into ten groups, with each constituent company given equal weight in its respective group’s results. The least expensive 10% of companies are represented in the group furthest to the left, and the companies that are most expensive in relation to their book values are on the far right. We use book-to-market, as it is both a widely studied factor and it allows this analysis to stretch back 70 years. We have seen a similar advantage for inexpensive companies when expensiveness is measured in relation to other fundamental qualities such as sales and earnings. In this analysis, on an annualized basis, the least expensive companies returned 13% more than the most expensive ones, and 6% more than the equally weighted market as a whole. To put this into perspective (in an overly simplistic way that ignores trading costs, taxes, and so on), if your grandfather, upon returning from WWII, had remained invested in this collection of inexpensive companies, he might have accumulated more than 1000-times the wealth of a speculator who stayed invested in the most expensive segment of the market. Importantly, his advantage wouldn’t have come from one or two really good years. Rather, the advantage of inexpensive stocks appears to have persisted across time. Others have published studies and performed simulations that show a similar story. You can see a good collection of examples here. Our takeaway is that a good route to realizing above-average returns seems to have been defining a process—even a very simple one—for buying shares in companies that are the least expensively priced in relation to something intrinsic to a company’s operations. As we reflected on the evidence that simple approaches for investing in inexpensive companies would have done well in the past, we naturally wondered about the opportunity to do even better by taking a deeper look at companies’ fundamentals. We sought to explore this opportunity using machine learning. Our goal was to examine the history of public companies in order to emulate the way an investor builds expertise. In our view, an investor builds skill through experiences. These experiences equip an investor to evaluate new investment opportunities in the context of prior outcomes—fruitful investments, losing positions, and opportunities examined but passed on. To the extent that these experiences, or “comparables,” from the past had done well, the investor’s confidence in the new opportunity would be high, and if similar situations from the past had brought losses, the investor’s confidence in the new opportunity would be low. Machine learning executes against this analogy by using data. As a simple example, a good investment outcome can be understood in the data as a positive change in a company’s market value over some period. Then, the tools of machine learning can be used to digest the characteristics of thousands of public companies going back in time to learn which qualities, when presented in the context of certain prices, correspond with high probabilities of good investment outcomes. Importantly, this learning process is not well suited to classical statistical techniques such as linear regression. Machine learning’s advantages include that it is well suited to finding meaningful, often non-linear relationships within vast collections of data. Euclidean uses machine learning in this fashion to learn from decades of investment experience in an automated way. We believe that an important advantage of this approach is that we are able to inform our learning process with far more examples than any one investor could experience on his own. Also, we can learn across multiple market cycles and digest outcomes without the cognitive biases that often seem to lead investors astray (such as recency bias and overconfidence in predicting future events, two biases that seem prevalent today). The outputs of this machine learning process are models that enable us to assess current opportunities in a way that is informed by the lessons of the past. Now, it is important to highlight one very strong bias that influences our findings, which is that we are interested in principles that have demonstrated their worth across a very long period of time. We are just as interested in how our approach might have performed in the 1970s as we are with how it would have in the 2000s. We feel this way because had we found that something worked very well for a short period (like how a growth strategy might have worked in the late 1990s or during the past several years), we would wonder whether we had found a temporary trend. Thus, we have always sought not the best-performing strategy for any given time, but the most timeless investment methods possible. In our case, the most basic lessons we validated are the simple merits of investing in good companies when they are offered at low prices and the value of moments when investors’ anxieties create these types of opportunities. But the lessons go much deeper. We found that there are better ways of assessing a company’s inexpensiveness than crude measures such as price-to-book or price-to-earnings, and that it is imperative to develop a nuanced view of a company’s true character by analyzing its operating history across many years. We believe that the lessons we have embedded into our approach have persisted across decades, are grounded in common sense, and would have enabled an investor to generate good results over most long-term periods. Of course, at any given time, the approach that works best depends on the circumstances of the day. During multi-year periods when valuation multiples expand and growth stocks are in favor, it seems clear that we will struggle to keep pace with the market. However, following similar times in the past, value investors achieved both strong absolute returns and robust relative performance versus the market indexes. Thus, we believe we are operating with history on our side. We will continue to ignore the macroeconomic developments that drive many other investors’ behavior, and we will seek to profit when other investors’ actions cause good companies to be offered at great prices. We believe that our investors will benefit as we adhere to this process during the years ahead. Historical results represented herein are for illustrative purposes only and are not based on actual performance results. The hypothetical portfolio and the associated returns do not reflect the effect of transaction costs, bid/ask spreads, slippage, or management fees. Historical results are not indicative of future performance. The analysis presented in the above chart used data obtained from the copyrighted data library created by Kenneth R. French and hosted at http://mba.tuck.dartmouth.edu/pages/faculty/ken.french/data_library.html.To construct the hypothetical annualized returns for each decile, we used data contained in this particular data file: http://mba.tuck.dartmouth.edu/pages/faculty/ken.french/ftp/Portfolios_Formed_on_BE-ME_CSV.zip. This dataset contains the monthly returns of 10 portfolios with the first portfolio containing the companies with the lowest, or most expensive, book-equity-to-market-equity ratio (BE/ME) and the tenth portfolio containing the companies with the highest, or least expensive, BE/ME. For presentation purposes, the decile order is reversed in the chart where decile number 1 is the least expensive and decile 10 is the most expensive. The universe of stocks considered is all NYSE, AMEX, and NASDAQ companies. Each company in each portfolio is given equal weight. The annualized returns are computed by compounding and annualizing the monthly returns for the period starting January 1, 1945 and ending April 30, 2016. For a more detailed discussion on this point, please reference this letter we wrote on the subject.